Saturday 10th November didn’t start well. I arrived on time for the start of what should have been a large protest to find nobody there. Of course protests are quite often planned and advertised on social media but never take place, some people get an idea it would be a good idea to have a protest, put up an event but give up when they find nobody shares their enthusiasm; others are cancelled at the last minute when I’m already on the way to them, and others were never really intended to take place. But this was different, a protest by a large group, so something was very clearly wrong. Fortunately I’d remembered to bring my phone – quite often I come out without it, as I did this morning, though I realised when I was only a few yards down the street and rushed back to pick it up. But other days I only think about it when my train is approaching the platform, or even when I’m actually at an event in London and put my hand into my pocket to phone someone and find the pocket is empty. But for once I’d remembered it, so took it out and began searching on Facebook for the event. I couldn’t find it. There were a number of possibilities. I was rather near one of my favourite pubs and it was tempting, but drinking early in the day when I wanted to cover more protests would not be a good idea. I could have gone to one of London’s museums or art galleries – and I often do visit one when I have a little time to spare, but I had long enough to do something else. I did a quick search on my phone for anything else of interest happening and drew a blank, so instead I decided to go and look for a protest in those London places where protests often occur. 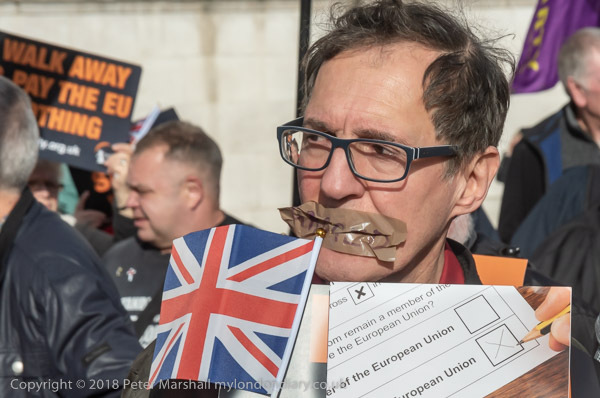 Their protest in Trafalgar Square about the lack of progress in leaving the EU also called for the resignation of London Mayor Sadiq Khan, and for policies which “Put British Laws, British Culture and British People first“. There were a number of faces in the crowd familiar from photographing groups such as the EDL and the National Front. They favour simply leaving the EU with no agreement, refusing to make any payments and fail to acknowledge the disastrous consequences that would follow. I’d soon had enough of being around them, and wandered off down the road to see if anything was happening at Downing St, or outside Parliament, but there was nothing. 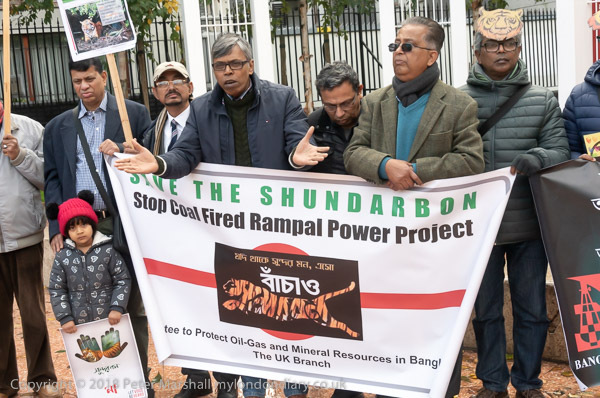 However it was now time to get on the District Line from Westminster to Aldgate East and the next event in my diary, a rally by the UK branch of the National Committee to Protect Oil Gas & Mineral Resources, Bangladesh, supported by others including Fossil Free Newham. 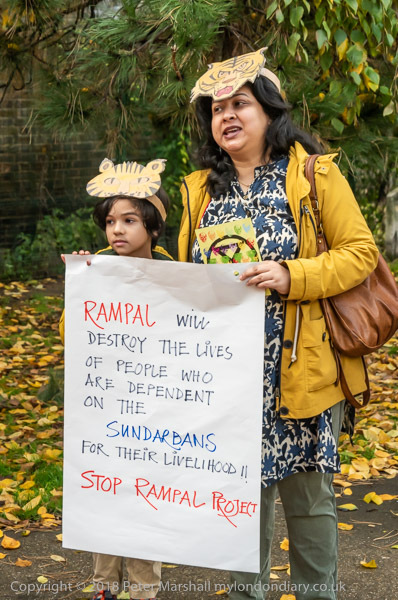 This was a part of a global day of protest to save the Sunderbans, the world’s largest mangrove forest and a UNESCO World Heritage Site, which was taking place in Altab Ali Park in Whitechapel. There are some protests which don’t take a great deal of time to photograph, with relatively little happening at least visually. People standing in a line with posters , placards and banners. The odd tiger. Losts of speeches, a few in English. 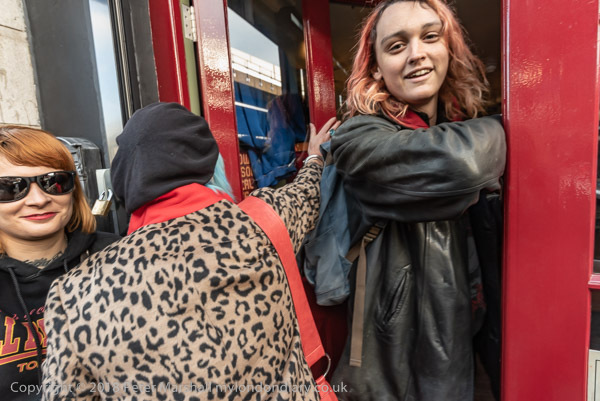 So I was soon leaving and making my way to the pub where I hoped to meet Class War. They were a little late so I had time to drink a pint without rushing. 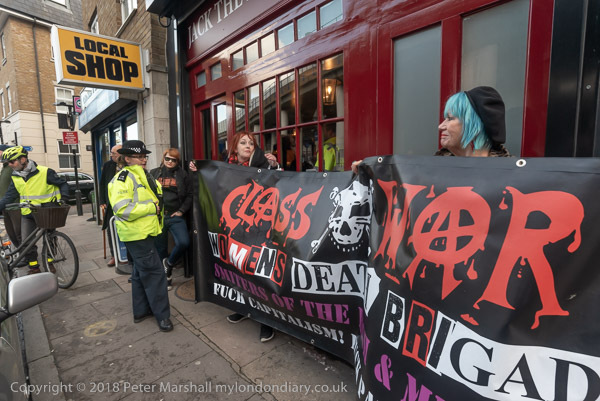 It wasn’t really a full-scale protest by Class War, just a short visit to remind the ‘Jack The Rippe’r tourist venue in Cable St, with its macabre displays profiting from the gory deaths of a few working class women, that it disgusts many and should close. Clas War are very much a group misunderstood in various ways by different people and often deliberately, but whose actions often attract far more publicity than many other groups – and their intention is to provoke. I don’t always share their views – though on the Ripper obscenity I’m 100% with them – but their activities are always interesting. Protest is definitely more fun with Class War, and they do very much raise the profile of important issues. Where I differ from Class War is that I’m more of a pragmatist and I don’t think the chances of getting revolution on anarchist lines is too probable in the foreseeable future. So while I share many of their opinions about the Labour Party, and in particular about criminal London Labour councils which are demolishing council estates, handing over public assets to private developers and failing to provide council housing for current residents and others who can’t afford high market house prices or rents who Class War are very rightly castigating, I’d like to support those in the party who are campaigning for socialists to take control of the local parties, which could bring about a real change. And while I don’t have particularly high hopes of what a Corbyn government might be able to acheive, I’m convinced that there would be some advantages over the Tories, who have shown themselves cruel, unthinking and quite simply evil beyond previous administrations. Though under our current system, my vote inone of the country’s safer Tory seats is entirely a worthless gesture. Leave Voters say Leave Now! This entry was posted on Monday, January 14th, 2019 at 04:26 pm and is filed under My Own Work, Photo Issues, Political Issues. You can follow any responses to this entry through the RSS 2.0 feed. You can leave a response, or trackback from your own site.